A knife-wielding Muslim screaming “Allahu Akbar!” threatened a Jewish man in New York City on Friday night. 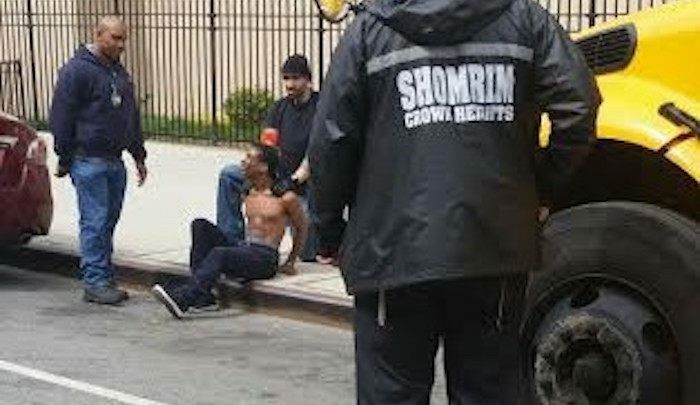 A man who was roaming the streets in Crown Heights on Friday without a shirt and a wielding a four-inch knife in his hand while yelling at a Lubavitcher Chusid “Allah Akbar” may soon face hate crime charges, sources familiar with the investigation told JP. Police say 25-year-old Naquan Smith, who has a criminal history with 10 prior arrests in New York City, was in front of 899 Montgomery Street with the knife in his hand Friday afternoon. Schneer Goldstein was at the intersection of Montgomery Street and Schenectady Avenue when he observed Smith with the knife in hand. Goldstein called 911 and Crown Heights shomrim. While waiting for their arrival, the anti-crime team from the 67th Precinct passed by and Goldstein flagged them down and they held down Smith. Shomrim member Natan Shusterman arrived on the scene and recovered the knife, a law enforcement official said. Smith was then placed under arrest by responding police officer Michael Mercado from the 71th Precinct, and Smith was charged with menacing and criminal possession of a weapon.